The attractive Taiwan Hill Partridge is often considered to be the toughest Taiwanese endemic bird to find. Today, I got lucky twice along the trail between the end of the road at Km 18, and the old Tengjhih National Forest HQ. The first birds were a pair that showed on the ridge above the path near the 225 meter mark (distances are red-painted on rocks at random points along the trail). Several hours later, on my return journey, I encountered a group of four – perhaps including the earlier pair – at around the 275 meter mark. Predictably, it was tough to get good views. Quiet stalking resulted in prolonged head-and-neck views of one bird in the first pair, but little more than glimpses of the second group as they worked their way through the undergrowth and eventually burst into flight. Get onto the trail early. A steady trickle of hikers from mid-morning onwards at weekends is likely to push the birds further away from the path. Also, in midsummer the excruciatingly noisy cicadas increase their chorus as the morning progresses, making birding by ear very difficult. Pick a calm day. On both occasions today, I first located the birds by creeping along the trail and listening for them scraping the leaf litter as they search for food. When there is a breeze, these sounds are easily drowned out by the rustling of the trees. Focus on the area between about 200 and 500 meters along the trail. They seem to particularly like the ridge to the right of the path as you walk towards the HQ. Another good bird today was the Besra, soaring over the end of the road at Km 18 and occasionally attacking the Striated Swallows that mobbed it. Also here, a Striated Prinia was singing in the usual area of the landslide. In the clearing about 50 meters along the HQ trail, a pair of Vivid Niltavas were observed carrying food and probably have a nest nearby. Finally, a group of six Eurasian Jays was a good count for this uncommon bird, and a total of four Black Eagles were seen at various times during the morning. 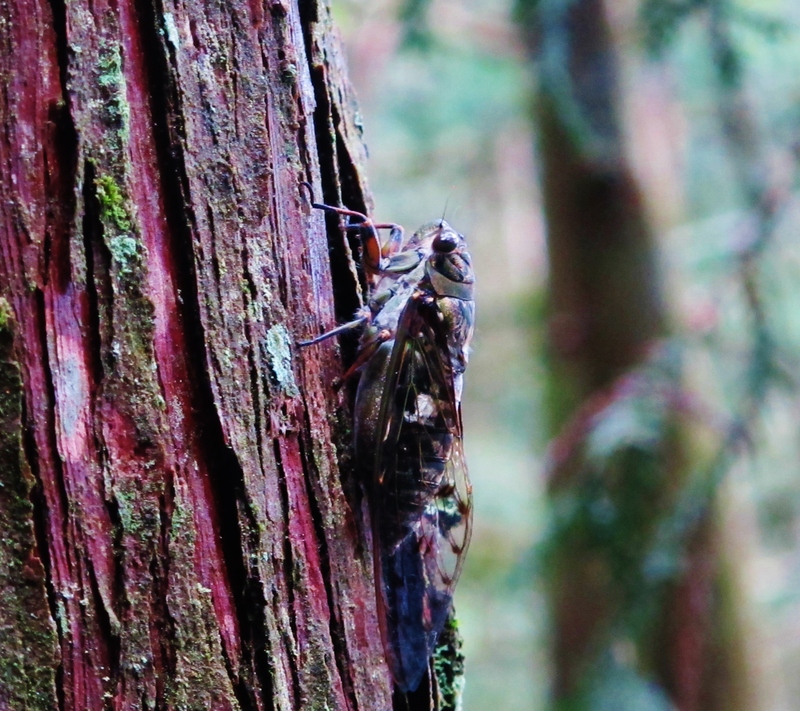 Cicada at Tengjhih National Forest. This noisy creature is not your friend when you are trying to listen for Taiwan Hill Partridge feeding in the leaf litter.